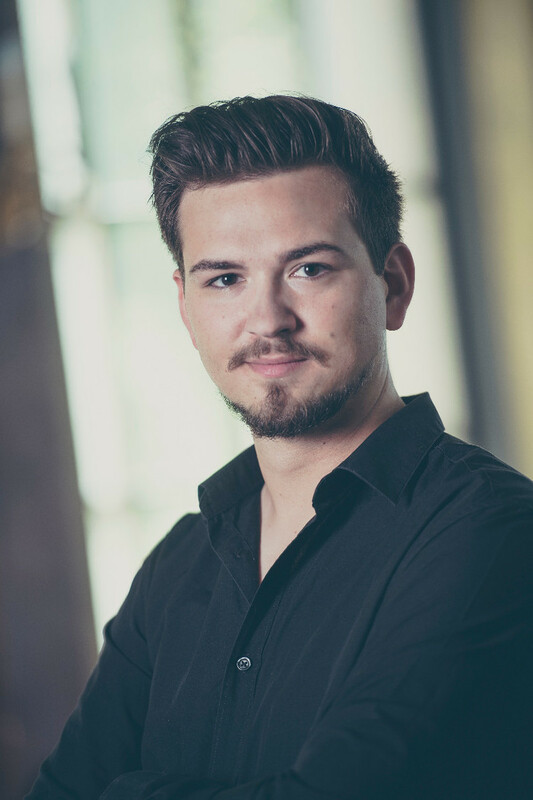 The German baritone Johannes Kammler is already in demand internationally at renowned addresses and is equally committed to opera, song and concerts. Johannes Kammler was born in Augsburg and received his first musical education there at the Augsburg Domsingknaben. Later he studied singing in Freiburg im Breisgau, Toronto and at the Guildhall in London. Only in October 2017 he was awarded the 2nd place at the renowned singing competition NEUE STIMMEN. Since September 2017, Johannes Kammler is a member of the ensemble of the Bavarian State Opera in Munich, where he was a member of the Opera Studio in the seasons 15⁄16 & 16⁄17, and sings there under Kirill Petrenko, Bertrand de Billy, Oksana Lyniv, Andrea Battistoni, Asher Fish, Marco Armiliato, Constantin Trinks or Ivor Bolton. Concerts as a soloist with the Berliner Philharmoniker, the London Symphony Orchestra or the Orquesta Sinfónica Simon Bolívar de Venezuela under conductors such as Sir Simon Rattle, Gustavo Dudamel, Sir Mark Elder and Marin Alsop have taken him to London, Berlin, Hamburg and Baden-Baden , Porto, Moscow, Caracas and Los Angeles. Future assignments include more recitals with Roger Vignoles at Wigmore Hall, Schloss Elmau and De Doelen Rotterdam, his role debuts eg in BARBIERE, ARABELLA, TOTENHAUS, CARMEN and LES VÊSPRES SICILIENNES at the Bavarian State Opera, and his debut in the summer of 2018 with the opera THE PROCESS of Gottfried von Einem at the Salzburg Festival. In addition, Johannes Kammler will be a new member of the ensemble at Guglielmo, Malatesta or Marcello at the Stuttgart Opera from the 2018⁄2019 season. In August 2015 Johannes Kammler debuted for the first time at the Verbier Festival as Marcello in Puccini’s LA BOHÈME. In the summer of 2016, he was engaged at the Den Norske Opera in Oslo for a scenic production (Calixto Bieito) of Britten’s WAR REQUIEM. In October 2016, he was invited by the renowned Oxford Songs Festival for a recital together with Roger Vignoles, with whom he has since been engaged throughout Europe for joint recitals. In the season 16⁄17 Johannes Kammler sang Haydn’s CREATION under Gustavo Dudamel at the Walt Disney Concert Hall with the Los Angeles Philharmonic Orchestra, as well as under Thomas Hengelbrock with the NDR Elbphilharmonie Orchestra as part of the opening of the new Elbphilharmonie in Hamburg. With roles such as Ruggiero in Halévy’s LA JUIVE, John Sorel in Menotti’s THE CONSUL, or Scherasmin in Weber’s OBERON at the Bavarian State Opera, the promising baritone received without exception excellent reviews. In the summer of 2017 he was allowed to make his role debut as Belcore in Donizetti’s L’ELISIR D’AMORE at the New Generation Festival in Florence.